In 2007, to the horror of my Burgundian winemaking buddies, I left Beaune and moved to the Rhône Valley. They couldn’t believe that I would forsake noble Pinot Noir for brash, in-your-face Grenache and Syrah. I went down south for the weather to work for an amazing company, Gabriel Meffre, that makes not only lush Grenache-led southern Rhône wines but also elegant, powerful northern Rhône Syrah. The move was a fortuitous one as it was there that I met my husband, an oenologist with an unabiding love for Syrah. Together we travelled throughout the northern and southern Rhône tasting Syrah on its own or in blends. And I began to understand his enthusiasm. Syrah is an intriguiging grape. In the northern Rhône it is peppery, with violet and cassis notes and a dry, almost austere character. In warmer climates, it transforms into a lush, almost hedonistic wine with sweet black fruit, chocolate and spiced notes. Either way, Syrah is bold. It is not a subtle, wallflower of a grape. It is an attention grabber. Perhaps not the wine you want with salmon on a hot summer night, but as we shuffle (reluctantly) into icy winter Syrah is a great choice. Especially when you consider the 14% + alcohol on many of the hot climate “Shiraz” labelled versions. Syrah is bold. It is not a subtle, wallflower of a grape. It is an attention grabber. If you can overlook the grey, chilly weather, the northern Rhône is an incredible vineyard to visit. In Côte Rôtie, vines are planted on slopes so steep they make you dizzy just looking at them. Côte Rôtie is about as far north as the Syrah grape can grow. It only thrives here because the best slopes are oriented south-east, hence the name which means “roasted slope”. This mix between cool climate and intense summer sunshine gives incredible complexity to the wines. They are both elegant and powerful; with pretty floral aromas and big, meaty flavours. Further south, the vineyards of Hermitage and Cornas also make top class Syrah, but that is a blog for another day. Hugging the famous hill of Hermitage and spanning outwards north, east and south, is the largest vineyard of the northern Rhône: Crozes-Hermitage. Wines from the northern part of the appellation, grown on granite, make richer, more complex wines while wines from the flatter, clay-dominant valley floor sites in the south tend to be simpler. Broadly speaking, Crozes-Hermitage is characterized by bright, red fruit, spice and earthy, herbacious notes. It is lively on the palate, with tart fruit; softer and less structured than the more illustrious villages, but generally offering good value. While Syrah has a long and storied history in the northern Rhône, it is a pretty recent grape for Chile. Most plantings date only as far back as the 1990s. Despite this, Chilean Syrah has gained the attention of critics world-wide for its high quality and diversity of styles. Chile’s vineyards stretch almost 1300km from the hot, dry north to the cool, wet south, hemmed in by the Pacific Ocean to the west, and the Andes Mountains to the east. Cooling ocean currents and high altitude plantings give bright acidity that lifts the rich, fruit-driven flavours. If you’ve read my blog posting “The Death of Joy” you’ll know that I am not fond of comparisons, but if pressed I’d say that the up-and-coming cooler climates of Elqui and Limari give a slightly more tart, Old World style (with fuller, riper fruit) and more southerly regions like Colchagua and Maipo give more powerful, lush New World type examples with firm, but rounder tannins and higher intensity of sweet fruit. The alternate name for Syrah, Shiraz, immediately brings Australia to mind. When I first started buying my own wine (rather than swiping bottles from my dad’s cellar), big, jammy, oaky Australian Shiraz was everywhere. Often bearing labels with cuddly koalas, or hopping kangaroos or some other such furry creature. Just like all fads, the wine world seems to have done a total 360°and now detests these wines, sadly causing Australian wine sales to plummet in many countries. This is unfortunate, as more balanced, nuanced Shiraz abound from excellent producers, with great examples as reasonably priced as 15$ – 20$. South Australia is prime Shiraz territory. The Barossa Valley produces big, bold wines, with dark chocolate and black fruit aromas. The coastal McLaren Vale region gives more mellow, velvetty Shiraz with red fruit, spice and peppery notes. The better wines from both regions have fresh acidity, poise and firm, but ripe tannins. For the purposes of this initial overview tasting, I chose examples from the following producers: (What do VW, PW and LW mean? Click on my wine scoring system to find out). The “Cap Nord” cuvée from excellent producer Laurent Combier showcases vineyard parcels from the Northern Crozes-Hermitage villages of Gervans and Serves. Restrained aromas of tart red fruits, pepper and smoky notes. The palate is vibrant; medium bodied with a smooth tannic structure and subtly savoury notes through the medium length finish. Chocalan is the local name for the yellow flower that grow wild in the Maipo Valley. Heady aromas of sweet spice, cassis liqueur, licorice and violets. The acidity, while fresh, doesn’t quite counter-balance the big, creamy core, high levels of toasty, vanilla scented oak and hot, 14.5% alcohol. Yalumba makes consistently high quality wines at all price points. The “Patchwork” cuvée from Barossa is full-bodied with a firm structure and big, chunky tannins. The nose offers an interesting mix of animal notes, dark chocolate, black fruits and menthol. Overly prominent oak and a touch of astringency knock this otherwise well-made wine down a peg for me. D’Arenberg is a go-to producer for fun, gluggable wines from the McLaren Vale. “The Footbolt” features a pretty, perfumed nose with sweet blueberry and cherry notes, violets, mixed spice and cedar. Lively and fullbodied, with a taut structure, smooth, subtle oak and chewy tannins. Represents good value for the price. Four generations of the Jasmin family have farmed this tiny, high quality 5 hectare estate. Big and brooding, with intense leather, barnyard, cassis and tobacco on the nose. Bracing acidity underscores the firmly textured, full-bodied red through the mid-palate. Well-integrated oak and firm, grippy tannins mark the finish. A linear, somewhat austere Côte Rôtie. Needs time in the cellar to unwind. Summer is drawing to a close. The kids are back in school, and it is time for me to kick my own studies back in to high gear if I want even a microscopic chance of passing my Master of Wine (MW) exams next June. So while most diligent students are hitting the books, I will be hitting the bottle…hard. It is an interesting sight to see a new mother rocking her baby in his bouncy chair while simultaneously blind tasting a flight of wines (cue the boos and hisses on my awesome parenting!). But that is how I will be spending the next 9 months. 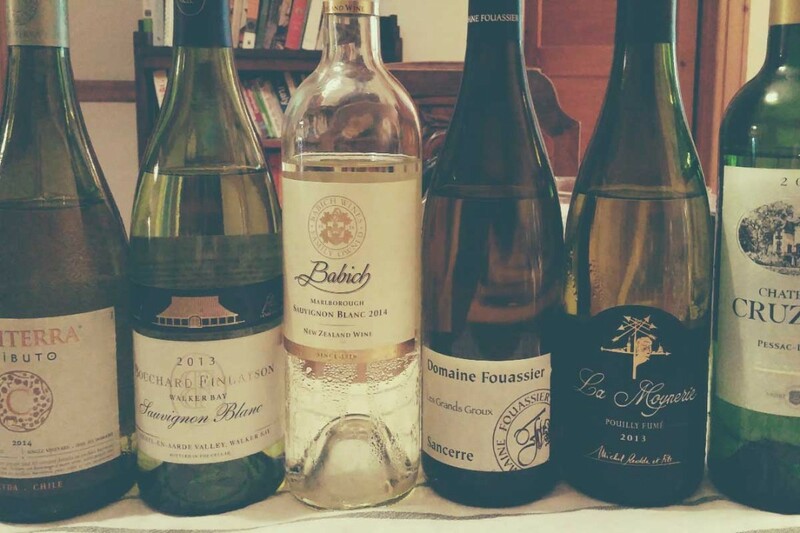 Each week a new flight, tasted with a fellow MW candidate, and a new tasting article for you lucky folks. Our journey begins with a comparative tasting of Sauvignon Blanc from the Loire Valley, Bordeaux, New Zealand, Chile and South Africa. This zesty white is generally high in acidity, dry, light bodied, with moderate alcohol; the definition of thirst quenching. Aromas range from citrus, grassy, gooseberry and mineral to more overt tropical notes, stone fruits and blackcurrant buds (the prettier, French description for the aroma Anglophones describe as “cat pee”). With the exception of sweet wines made from botrytised Sémillon/ Sauvignon Blanc blends, Sauvignon Blanc is generally meant to be drunk young (within 2 – 3 years of harvest), while the bright fruit aromas and bracing acidity are at their height. I first discovered how seriously good Sauvignon Blanc can be on a visit to the Loire Valley, the presumed origin of the grape, shortly after I moved to France ten years ago. The charming, 11th century village of Sancerre is perched on a hilltop looking down on its vineyards and pastures. The streets are lined with signs boasting wine tastings and little cafés where my friends and I ate sharp, earthy Crottin de Chavignol goat cheese, the perfect partner for the local tart, flinty white wine. After an epic, 4-hour tasting with Alphonse Mellot in his labyrinthine cellars, complete with scantily-clad ladies astride model bi-planes strung from the ceiling, I was hooked on Sancerre. Elegant and light bodied, with searing acidity, and delicate citrus, gooseberry and mineral-rich aromatics…impossible not to love. Neighbouring Pouilly Fumé makes a similarly whites, though generally in a richer and broader style. A school tasting trip to the Graves area South of Bordeaux revealed a totally different style of Sauvignon Blanc to me. First of all because they tend to blend with the Sémillon grape, and secondly due to the often liberal use of French oak. The acidity is still quite striking, but the wines have more body and a subtly creamy, nutty texture. Aromas include lemon, grassy notes, currant bud, all underpinned by the oak flavours. While France is its historic home, New Zealand claims to be the new king of Sauvignon Blanc. The majority of plantings come from the cool Marlborough vineyard on the South Island. Intense, “in your face” grassy, asparagus and gooseberry aromas dominate here, with riper examples showing lots passion fruit and peach notes. Most wines are unoaked, with racy acidity, light body and moderate alcohol. Less well known currently, but growing rapidly in reputation are the cooler coastal areas of Chile (especially the Casablanca and the San Antonio Vallys) and South Africa (Western Cape coastal region and Cape South Coast). Both countries produce a range of styles, from lean and crisp to more lush and tropical. Their Sauvignon Blancs are regularly described as being mid-way between the restrained, elegant style of the old world and the overt, heady new world offers. I had the opportunity to taste some fantastically vibrant examples from the Walker Bay area South East of Cape Town when I worked there. The ocean breezes drifting in from the South Atlantic Ocean give a zesty, saline finish to the wines. Domaine Fouassier farms his vineyard according to organic, and where possible, biodynamic principles. This wine shows excellent Sancerre typicity with elegant aromas of lemon, green apple and white florals hints on the nose. It has bracing acidity, a light body, integrated alcohol and an intriguing chalky minerality on the medium length finish. Very pleasant and balanced. Lacks the concentration and depth of flavour of top Sancerre. The third generation of Redde sons are currently running this 42 hectare estate in Pouilly Fumé. Grapes planted on flint, limestone and marl soils are blended here to create a mineral-laden nose, underpinned with citrus aromas. Vibrant acidity gives way to a rounded, smooth mid-palate. The finish is lifted and mineral. Highly drinkable and good value for the price, though not especially complex. Château Cruzeau is owned by the highly reputed Bordeaux producer, André Lurton. A deeper yellow gold colour is the first indication of the richer, fuller Bordeaux Sauvignon Blanc style. Intense currant bud, lemongrass, apple and oak aromas abound. Fresh, juicy acidity marks the palate, with a medium bodied, subtly creamy mid-palate and reasonable oak integration through-out. Short finish. Family owned since 1916, this large, award winning estate offers high quality at incredible value. Pale, white gold. Surprisingly elegant; with less of the pungent grassiness of many comparably priced Marlborough Sauvignon Blancs. The nose is refined, with lemon, passionfruit, floral and subtle mineral notes. Lean, with racy acidity, lots of juicy passionfruit and lemon flavours and a soft, rounded finish. At less than 20$, this is a bargain. An entry level brand from the owners of leading Chilean winery Errazuriz. Caliterra “Tributo” is a clean, well-made but fairly simple offering, with pungent vegetal, guava and lemon notes on the nose. Crisp and light-bodied, with moderate alcohol. Easy drinking but unexciting for the price. This 25 year old winery sits on an incredible plot of land in the stunning Hemel-en-Aarde (Heaven and earth) Valley in the Walker Bay. Their house Sauvignon Blanc is an intensely aromatic offering though the lime, verbena, and grassy notes have a slightly acrid quality to them. More pleasant on the palate; smooth and light bodied with moderate acidity, lots of juicy peach and lime aromas through the finish.